Long ago in 1972, British Rail retired from service the Brighton Belle, a train from 1932. When introduced in the depths of Depression as part of the Southern Railway’s first main line electrification in Britain, the train was specially designed. It was equipped with the most modern, iconic, Art Deco interior as a Pullman train for the ‘great and the good’ who lived in Brighton. It replaced a steam-hauled Pullman, and now they had got a magnificent, modern, electric service. During the three iconic Brighton Belle units’ fascinating history they were: withdrawn in WW2; damaged in the Blitz; repaired and restored to run afterwards, allowing them to remain in service when their contemporaries had long since departed to scrap yards. The Brighton Belle ran mostly three times a day, Brighton to London Victoria – but this light service (compared with other trains), plus the lull from the War, allowed lifetime extension into the 1960s. From time to time the Belle was chartered; it assumed Royal duties, even carrying H.M. The Queen, but by the 1970s it was old and battered, outclassed by new trains that rode more smoothly and were without a supplement charged. Still, the Belle generated many stories, with patron Sir Lawrence Olivier thwarting a threat for kippers to be withdrawn; the train was used regularly by stars like, Olivier, who lived in Brighton. When withdrawn in April 1972, not one of the unique carriages was allowed to go for scrap. They all became pubs or restaurants, were used on heritage railways, with some of the first class cars jewels even being sumptuously restored to service in the Venice, Simplon, Orient Express, British Pullman. Alas, after the turn of the century it was clear that some cars had been discarded, and were likely to be scrapped. 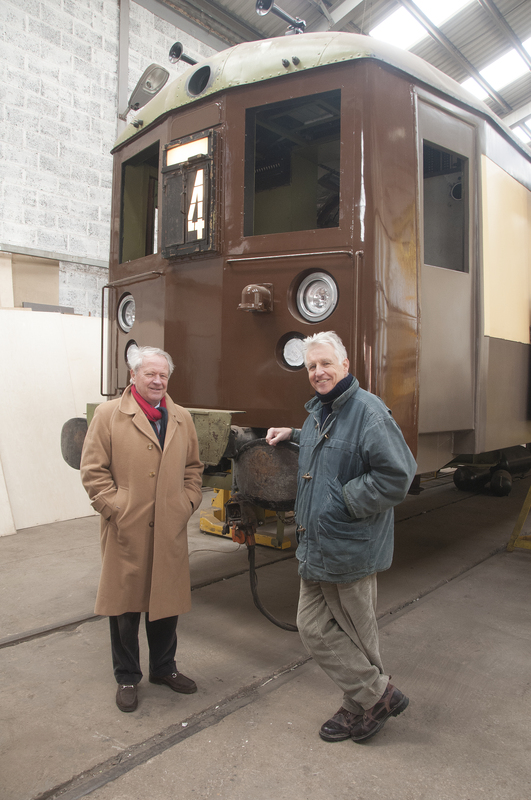 A group of people decided to restore a Brighton Belle train. Careful thought revealed that to be effective, and to allow people to appreciate the glorious manifestation of Art Deco that had was present, the goal should be to return the Brighton Belle to the main line as the unique electric Pullman in the world. Here the challenge really began, as in the years since the train was retired, the railways south of the Thames have become real people-moving machines, with new, efficient, fast and safe multiple-unit trains, running at up to 100mph, controlled by modern signalling – would Brighton Belle be allowed to enter the dense flow of this 90mph intricately timetabled and vital transport system? If the team had known then what we know, now we may never have embarked on the restoration. However the determination of the backers and the team, led by Denis Dunstone, was that this train’s value is best appreciated running on the main line – and that was what it was built for. To do otherwise would be to consign it to a life of being dragged up and down a heritage line unpowered. The electric train has been taken almost entirely for granted – bearing in mind its generous gift to humanity, so restoring the Queen of Electric Trains is a worthy goal. Nothing like it exists anywhere else in the world. The great luxury of the train, together with wonderful Pullman service, is the flexibility of being able to go anywhere on the third-rail network, get in and out of terminal stations quickly, and if required, to go off the third-rail network altogether. This made it both exciting and desirable as a project. Besides it’s a proper train – and that’s rare in preservation. Returning the Belle to the main line was expected to be costly and difficult. None anticipated the complexity of the works needed to achieve the standards now required. It can and will be done, and the successful finish of the restoration is now within sight. However, the expense has been massive (+£6m) and the timescale much extended. For that we apologise. Yet we have been constantly encouraged to plough on, and have done so. A ‘testable’ train was chosen as a starting stage – and that accounts for why the first iteration will be four cars long. The carriages that make up the train were both given, and bought – some at generous prices, and one for a very large sum. When we began it was clear that those now discarded remaining carriages not restored, that had been ‘saved’ since its 1972 demise, had doubtful futures. The lack of space across the former 3rd class vehicles was unfavourable to dining – the true advantage of Pullman. Thus extra work has gone in to following Pullman Car. Co practice, and converting them 2+2 to 2+1 seating. At the end of it all we shall have a 6 Car train that is capable of 90 mph top speed, that can accelerate as fast as modern trains, is fitted with all the necessary safety updates, and for the first time, will give the Brighton Belle a decent, smooth ride.. The original, glorious Art Deco interior has been restored; the beautiful umber and cream paintwork is being reinstated. The comfort level has soared, fitting the train for superb dining as well as making it a delight to the eye. 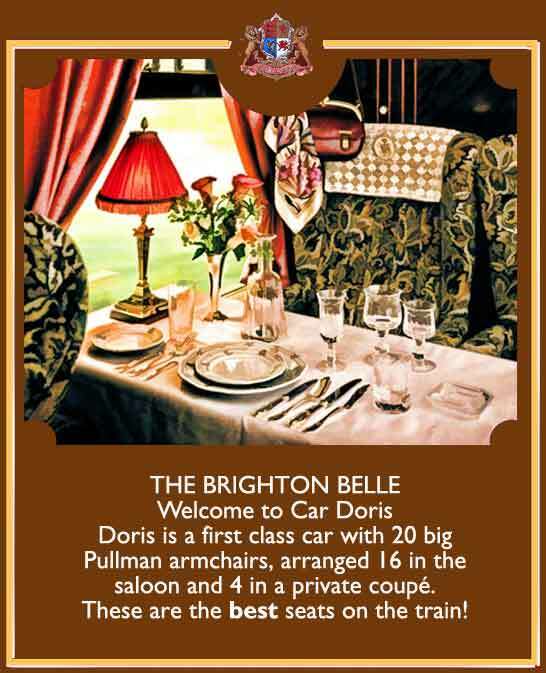 Half-a-saloon is now a kitchen, in combination with that in the First Class Car Doris. Soon the pleasure of seeing the Brighton Belle whining elegantly through the Sussex countryside will return, and it will be available for charter and days out across the whole third-rail system. 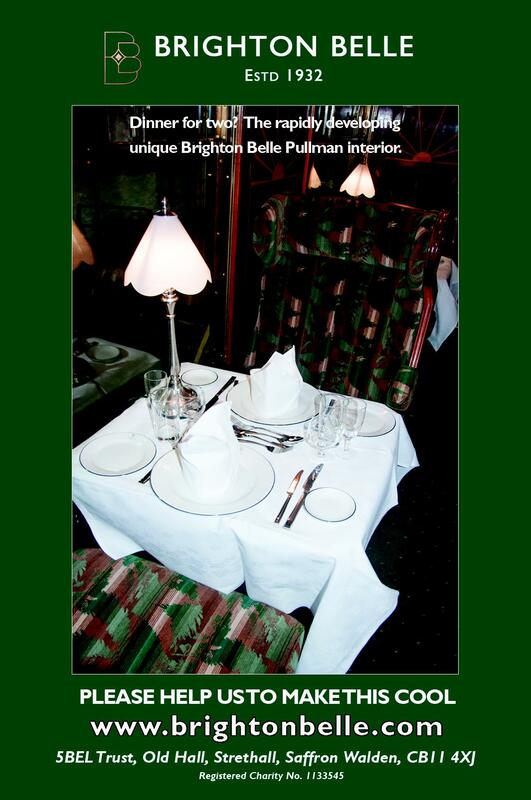 There is a substantial demand for pleasant days out by rail; the Pullman comfort of Brighton Belle certainly enables that. The kitchens and the staff on board will offer top-quality dining, whilst the train glides smoothly through the Garden of Kent, the Sussex Weald or the glories of Thanet, taking the guests for a memorable visit to one of a huge variety of venues. It is a feature of this train that it can reverse direction within moments; it will fit neatly in to almost any station. Although it takes its power from the third rail, it is also able to be pushed or pulled by a locomotive, and so excursions to anywhere on the system are practical. A range of Pullman days out will be offered, with the emphasis on relaxation, comfort and fine dining. The train may also be chartered – and what a superb private event this unique and elegant conveyance will make. Today people value luxury days out, and it is something about the quality of comfort and traditional service that we shall offer that will allow this train to come back to a big welcome when it is placed in service – hopefully in 2019-20. The eventual train capacity will be over 170, but initially the train will be launched with 4 cars and just under 100 places. All the wide, thick velvet seats have deep, sprung cushions, with the Car Doris offering individual armchairs of great comfort. When you see this superb train glide past in stately fashion, with its gleaming umber and cream Pullman livery, there can be only one result – you will just have to go for a day out on the Brighton Belle – the Queen of Electric Trains. If you would like to contribute to the restoration, we would really welcome your cash contribution for you to become a ‘Friend’. Please see the section market ‘donate’. If you would like to visit the train before it goes to Eastleigh for testing, then note that Friends will most likely be invited for a visit next year. 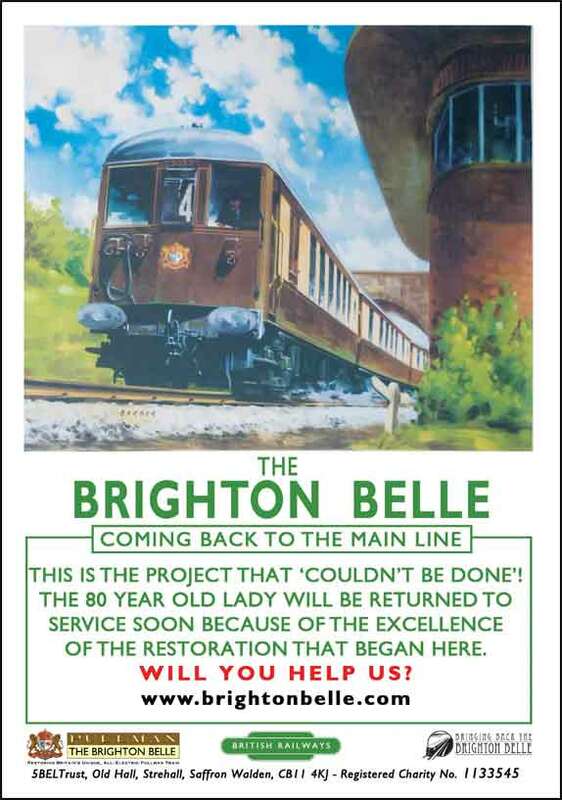 The project to restore the Brighton Belle to the British mainline is the largest and most complex heritage rail restoration project underway in the UK. It was launched by the 5BEL Trust, a registered UK charity, in June 2009. The Brighton Belle was the most famous electric train in the world, running each day between London and Brighton between 1933 and 1972. The quality of the accommodation puts today’s First Class carriages in the shade, with each car individually designed by a different leading British design house. It was – and will be again – the leading icon of the Art Deco period. Our aim is to have this wonderful train running on the mainline for many years so that future generations can enjoy an authentic 1930’s travel experience. Denis Dunstone [Chair], Stephen Baxter, Mike Hart OBE, Douglas Lindsay, Stephen Murfitt, Gordon Rushton, Stuart Wilkinson.